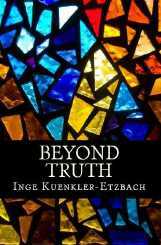 Summer 2010 I edited “Beyond Truth”, a new book by Inge Kuenkler-Etzbach (now available on Amazon). As it turned out, her life’s journey and my own, although very different, resulted in some surprisingly similar perspectives about the nature of reality and the challenges and opportunities of our postmodern age. Below is the introduction I wrote for that book. Things aren’t like they used to be. My parents came of age at a time when the authority of the Church was surpassed only by the power-lust of the State. Neither were questioned and individual identities were formed (for good or ill) within and through these simultaneously violent and sheltering contexts. My own children are growing up in a world in which authority is routinely questioned and seamlessly rejected. Too much is known of the fallibility and corruptions of Church and State. In their world the guiding influences, the agents of power and authority, are largely invisible: cloaked in well-established marketing ploys designed to sell the unnecessary to the underpaid; or shielded by self-proclaimed “righteousness” of one deadly sort or another. Today too much is known, and yet not enough. So many often unpredictable and seemingly senseless influences affect the formation of personal identity and moral clarity. And while this generational shift can be interpreted as frightening evidence of the utter randomness of existence, and/or an underlying moral void in the universe, or even an apocalyptic inevitability, it actually gives me “hope”. It gives me hope because it means that we no longer have to be blind followers of tradition. It gives me hope because we no longer have to be mute servants of systemic injustice. We are becoming, by necessity, on guard: awakening to one another’s pain, sensing our responsibility and encouraging cooperative risk-taking. Our identities are growing. We are beginning to recognize ourselves and one another as so much more than we may have thought: as healers, teachers, builders and stewards of history. Today we are empowered and guided not by Church or State, not by Market or Ideology, but by that which animates and unites each one of us: the Spirit of Life! The time in which we now live, as confusing and dangerous as it may seem and often actually is, empowers us to step from under the shadow of authority as we have long known it. It asks us to be guided instead by the light of truth – to be found within. This is no easy task when you’re used to looking elsewhere, if you’re bound by fear, or seek perfection in uniformity. There are no easy formulas or shortcuts. It takes courage. And it is essential to be curious about and welcoming of the perspectives of others; to be mutually committed to sharing and building upon accumulated insights in the service of love and compassion. The challenges inherent in this task are many, yet they give me cause for hopefulness. They support an understanding of the primacy of our relationships with one another, of the need to foster transformational trust and goodwill. This entry was posted in hope, post modernism, unitarian universalism and tagged post modernism. Bookmark the permalink.